I teamed up with Kroger to bring you this post. As always, all opinions are my own. Some people think salads are boring, but I’m definitely not one of those people. I eat at least one salad every day and sometimes I’ll have two a day. They never really get old. The greens are like a blank canvas. You can top them with a variety of fruits and vegetables and create a masterpiece. 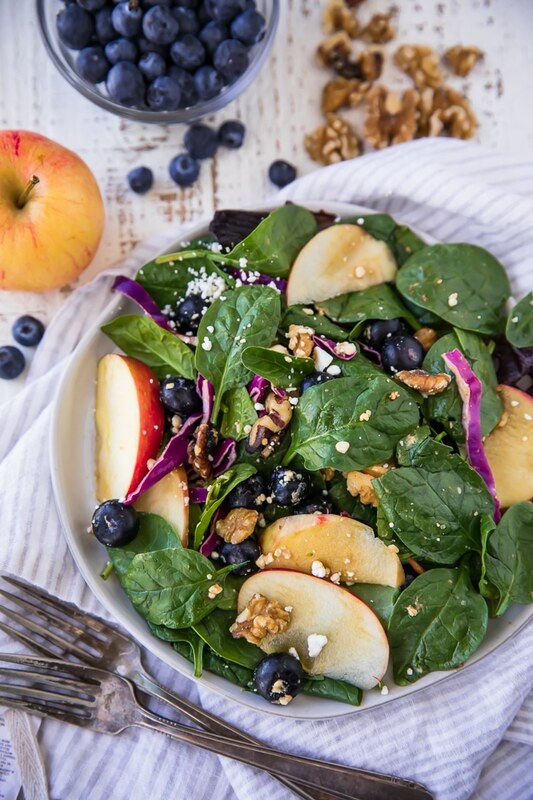 My current favorite salad is this Heart Healthy Blueberry Spinach Salad. It is a true work of art! And the best part, it is a tasty work of art! I love everything about this salad! 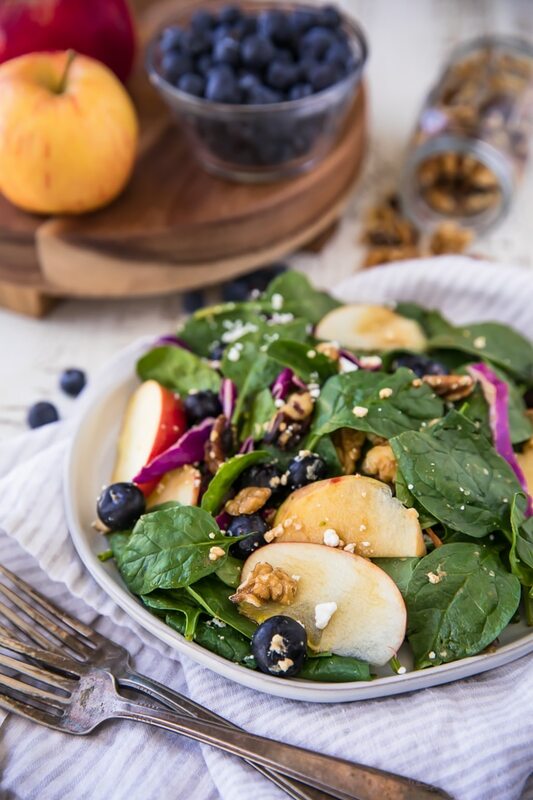 To honor Heart Health Awareness Month, I wanted this particular salad recipe to be a nutrient-dense, plant-based salad that combined fresh blueberries, apple slices, walnuts and baby spinach. It had to be big (my salad motto = go big or go home), flavorful, colorful, filling and delicious (duh!). The final result totally fits the bill. 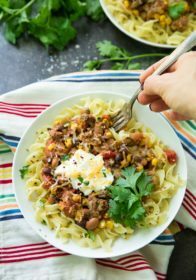 It’s packed with fresh produce and a few other ingredients from Kroger and combines a variety of tastes and textures. From the sweet berries to the creamy tangy feta, and the crunchy walnuts — no two bites are the same. Not only is this salad healthy and tasty, it’s super easy too. 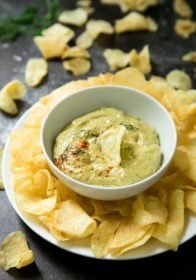 Simply toss together the ingredients and feel free to experiment with favorite greens, other fruits and other things you already have on-hand. This salad would also be brilliant with strawberries, pears and kale. Want to make the salad a little more hearty? Add quinoa, grilled chicken or seared salmon (also heart healthy!) to make this more of a full dinner salad. And a quick note about the dressing – I happened to use a mission fig flavored balsamic vinegar and it was so lovely, I didn’t need to worry about adding any olive oil or other dressing. I happened to notice that Kroger sells a strawberry fig balsamic vinegar, which would be perfect, but again get creative and use a favorite dressing or vinaigrette. This salad makes it easy to get your fruits and veggies in! It’s loaded with goodness! I could easily eat this salad every day and I think I just might! So if you need a new kind of salad in your lives (which you all totally do!) give this one a whirl. It won’t disappoint! 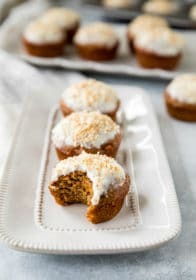 I’d love to know if you make this (or any) recipe! 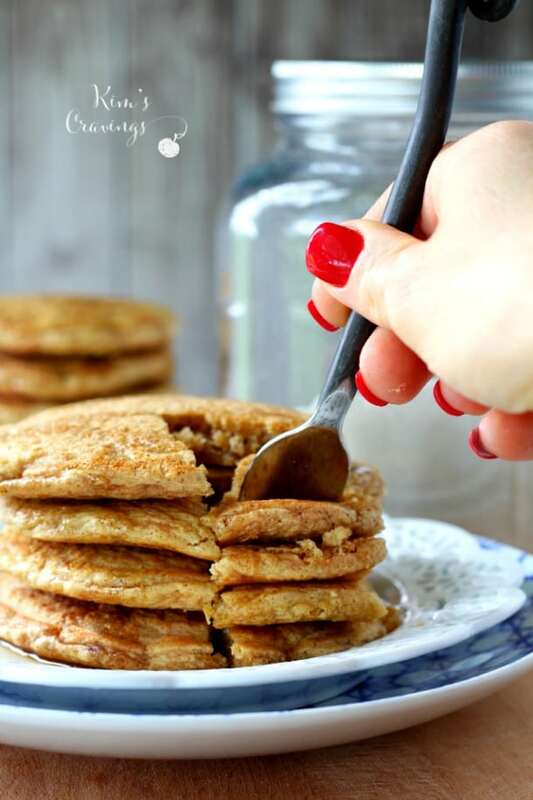 Tag @kimscravings on Instagram and be sure to subscribe to the mailing list to receive more healthy, delicious recipes straight to your inbox. A light, refreshing salad loaded with the all the good stuff! Place all salad ingredients in a large bowl and toss with balsamic vinegar or other favorite vinaigrette. Divide into two salads and add salt and pepper to taste. Enjoy! Measurements provided are a guide, feel free to use a little less or a little more depending on preference. MAKE IT DAIRY FREE: Omit the cheese. MAKE IT NUT FREE: Use sunflower seeds instead of walnuts. MAKE IT PORTION FIX APPROVED: Use colored containers to measure out ingredients. This salad works perfectly as a blue (half feta, half chopped walnuts), purple (half apple, half blueberry) and green. 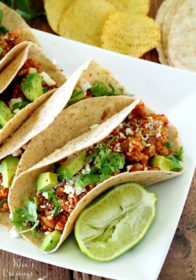 Looking for more heart healthy deliciousness? 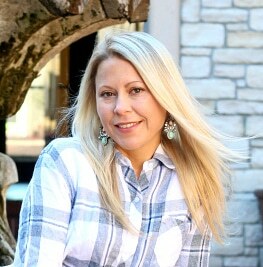 Check out my other favorites! How are you honoring your heart for Heart Healthy Awareness Month and every month? Find plenty of heart healthy ingredients and inspiration at Kroger! Also, be sure to visit Kroger during the month of February to get a free cholesterol screening. I love that it’s a combination of fruits and veggies! Talk about healthy!Also, it’s nice that you’re sharing this recipe to raise awareness on heart health, which is very important. This salad looks amazing! Thank you so much for the recipe. This is definitely going to be my lunch at some point this week! Thanks! Hope you love it as much as I do! I’m not a salad person, but when I do eat them, these are the kind that I want to eat. This salad looks delicious! This salad looks amazing! Some people hate eating salad because they feel like they aren’t getting something decadent. Not me! Not only do I love salad, I love this kind of salad! My husband and I really love salads, particularly I am fond of BIG salads with LOTS of stuff int hem. I literally love to make a big bowl and just toss whatever is in the chill box into my salads. My husband really loves nuts and fruits in his salads, so he would really enjoy this one! I am totally a salad person and THIS is my kind of salad! 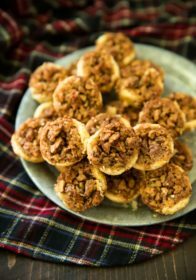 I usually use strawberries and candied pecans but this looks fantastic and I WILL make it! I have not used blueberries on salad before but luckily I have some to give it a try! Love the strawberry and pecan idea! What a great way to mix it up! 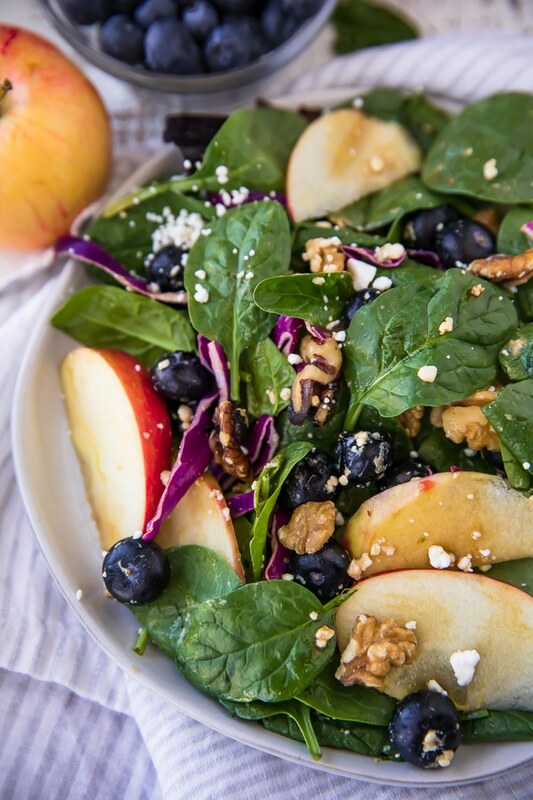 I have never thought of mixing blueberries into my spinach salad! I must try this, it looks very appetizing. Yes, you so need to give it a try! Yum, this looks like a salad I would love. I’ve always been a fan of blueberries. That looks like a mouthwatering salad. It is so healthy and so colourful. I’m not very good at preparing salads for myself, but I LOVE eating them. I think That I may have to try make this one as I am on a huge spinach kick! Talk about the perfect salad! I like that it’s also about heart health, since that’s something that’s very important. I don’t mind making this salad every day! It looks so good and it’s good for your heart. Thanks, Karen, and you’re so right. Heart health is a super important topic. Awww… what a sweet story. I’m with your grandma, I love fruit in my salad. Ouu la la this speaks to my soul. 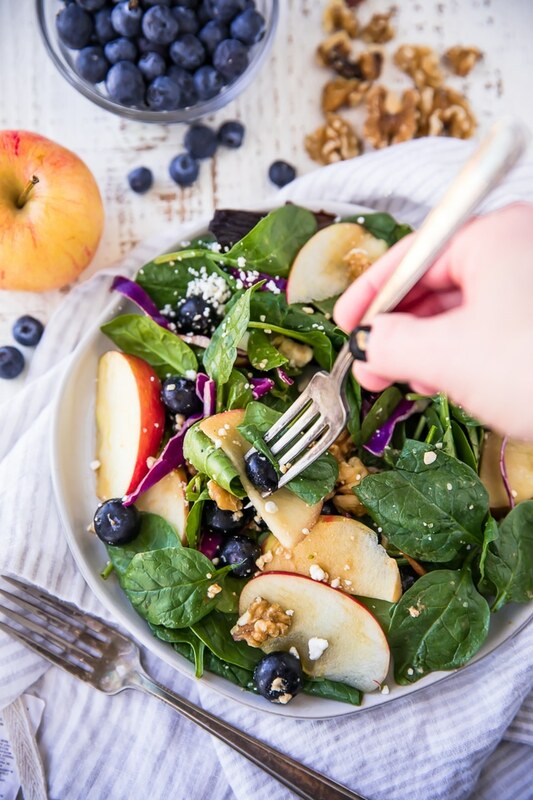 First of all, sweet salads with fruits in them make it much more refreshing and tasty when its eaten as a snack or quick fix before a bigger meal. For a second there I thought these were sliced pears and not apples, I was excited to try something new. I make a salad similar to this but would enjoy these ingredients just as much! 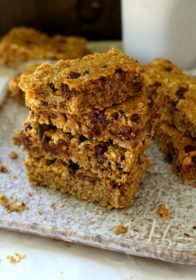 Keep up the delicious and healthy recipes! Thanks so much!! Pears would be awesome too! 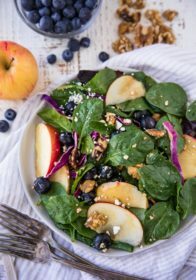 Now I would never have thought of using blueberries in a salad but what an interesting idea, I bet it tastes so very different. I’ve always loved salads. 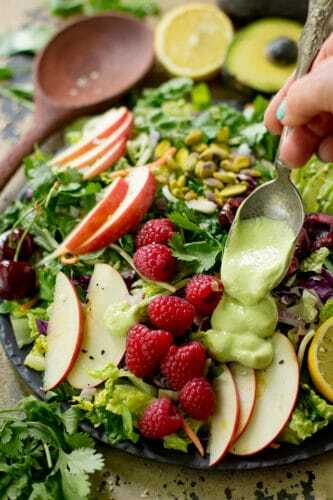 Sweet salads with fruits together than make the salads are so great. I have been craving a delicious salad and this looks like a winner. Blueberries are on sale this week too, I need to go get everything to make this salad. What kind of vinaigrette do you like to use? I love using a balsamic vinaigrette or a flavored balsamic vinegar for this salad. Hope you get a chance to give it a try! 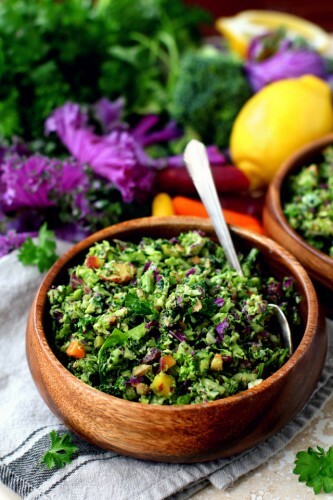 this salad looks amazing and I love that you have it so well balanced. love the crunch of the apple and walnuts oh and the cabbage. It looks great as a side dish or with some grilled chicken for a full meal. OMGoodness, I always add blueberries to my salad also! I just got the kids to eating spinach and they love it. I even add granolas at times to my salad and the vinegar dressing is the best! 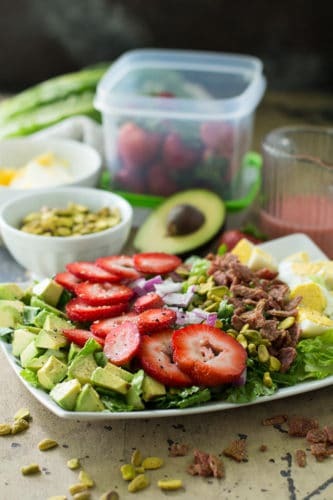 Now I want to try your strawberry cobb salad it looks so yummy, actually they all do! You know I never thought to put bluberries in a salad! Inteesting and I bet even more healthy. I am always so boring when it comes to salad. I never know how to make it interesting! this will sure help! I am not big on spinach so might replace it with lettuce! This salad looks amazing. I love the blueberries and apples. 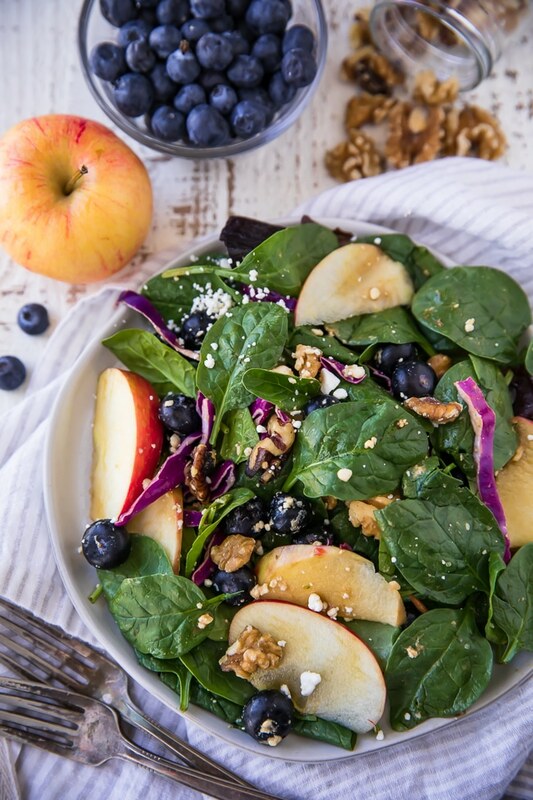 The Heart Healthy Blueberry Spinach Salad sound delicious! I’ll try to make this later at home! yummm! I love adding fruit to my salads! This looks super tasty, thanks for the new recipe. Yunmmm! All my favorites in one plate! I’ll try to make this on a weekend! !